More work must be done to highlight the benefits of compact system cameras (CSCs) as British sales slump, Nikon UK bosses have said. Last year Nikon was forced to cut back its global forecasted sales of CSCs and, in the UK, the overall market was well down on the year before. 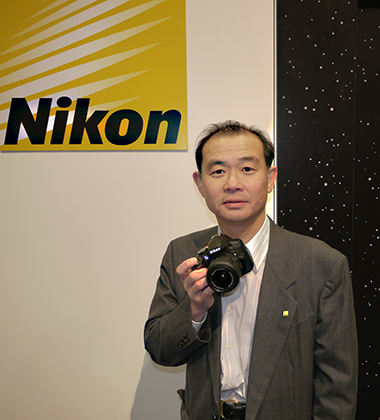 ‘If we look at the market worldwide, it’s not so promising but in the Japanese or Asian market [CSC] is still well accepted…’ said Hidehiko Tanaka, managing director of Nikon UK in an interview with AP at last week’s CES. Tanaka admitted that the public may be confused over the benefits of CSCs, despite an advertising campaign and training sessions for the public held at the Nikon School in London. Nikon wants to more clearly target the format towards particular customer needs – an example being the ‘waterproof’ AW1 version of the Nikon 1 launched last September – and believes CSC still has a place between a low-end compact and the company’s flagship DSLR, the D4. ‘If you look at our 10x lens, it’s the world’s smallest – if you are on a trip it’s really light and the picture quality is good,’ said Tanaka. The company feels it must do more to promote the compactness of the format, an area it believes is key to its future success. ‘There’s still quite a bit of work to be done to highlight the benefits over the compact…’ said Nikon UK’s group marketing manager Jeremy Gilbert. Part of the problem, according to Gilbert, is that consumers do not see CSC as a separate category, in the way manufacturers do. Meanwhile, he says the industry faces the difficulty of investing in and supporting ‘three pillars’ – compact, CSC and DSLR. Despite the challenging market, Nikon says it remains committed to the CSC format. ‘I think you can say from the launch of the AW version of the Nikon 1 that we are committed to investing in what could be seen as a niche market,’ continued Gilbert. However, Tanaka would not be drawn on Nikon’s plans for CSC in 2014, only saying that the firm will continue to support this area.